Hand yoga (or "Mudra") illustrations paired with bright, ornamental watercolor designs. The physical body is made up of five elements namely, Air, Water, Fire, Earth and Sky. A mudra is a gesture or positioning of the hands intended to direct energy flow and to connect parts of the body to the brain as life force energy flows through the body. 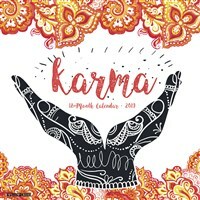 (http://idayofyoga.org) This large format wall calendar features grids with ample room for jotting notes and begins with six bonus months of July through December of 2018. Also included are moon phases (CST), along with U.S. and international holidays.